The beauty industry’s first and only EPA and State approved hospital-grade disinfectant POD. MOD Clean is effective against HIV-1, Hepatitis B, Hepatitis C, Staphylococcus, Pseudomonas, Salmonella, Clostridium Difficile (C.Diff), Vancomycin Resistant Enterococcus (VRE), Herpes, Influenza (including H1N1). Stop pouring your money down the drain with liquid disinfectant. MOD Clean is the easiest, most affordable, and safest way to MODernize your disinfectant. These pre-measured pods are made exclusively for the beauty industry allowing you to take the guesswork out of mixing your disinfectant properly. MOD Clean’s unique design is small, lightweight, and precise, taking up much less storage space than cumbersome liquid disinfectant bottles. 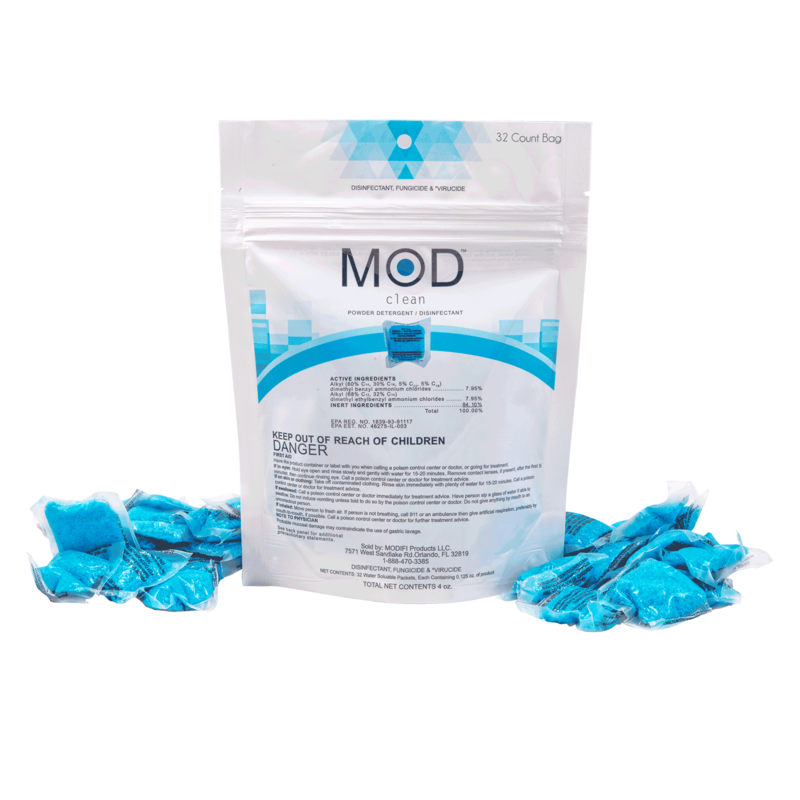 MOD Clean is packaged in resealable bags for your convenience and are recyclable as well, making them environmentally friendly. 1. Fill a standard disinfectant jar with water. 2. Open MOD Clean’s re-sealable bag and remove one pod. 3. Drop pod (the complete pod, do not tear open) into disinfectant jar. 4. Replace jar’s lid, the basket will submerge the pod under water. 5. Wait 10 seconds and lift the jar’s lid up and down repeatedly. 6. You now have perfectly mixed disinfectant, every time! MOD Clean can be safely used on plastic combs, brushes, plastic clipper guards, manicure implements, scissors*, stainless steel implements*, shampoo bowls, etc. * MOD Clean is not an anti-rust formula and it is recommended that scissors, stainless steel and other metal implements be removed after 10 minutes of contact. "A pre-measured disinfectant that's space saving...what's not to love!"